Lineage: Formed at Trichinopoly by Captain Thomas Lane in 1776 of drafts from the 1st, 3rd and 8th Carnatic Battalions and designated the 16th Carnatic Battalion. Then the 16th Madras Battalion in 1784 and the 2nd Battalion, 5th Regiment of Madras Native Infantry in 1796. Then in 1824, it became the 16th Regiment of Madras Native Infantry and the 16th Regiment of Madras Infantry in 1885. In 1901 the Regiment became the 16th Madras Infantry, then in 1903 the 76th Punjabis and in 1922 the 3rd Battalion 1st Punjab Regiment. Composition in 1914: 4 Companies of Punjabi Musalmans, 2 Companies of Sikhs and 2 Companies of Jats. 1919: 2 Companies of Punjabi Musalmans, 1 Company of Sikhs and 1 Company of Jats. Location in July 1914: The 76th Punjabis was stationed at Jhelum (Punjab, Pakistan) having arrived from North China on 14th July 1911. The battalion is well trained and commanded. The officers are keen and attentive to all their duties. The tone and spirit of all ranks is good and the men are satisfied and content. They move well in close order drill and work quietly and smartly. The wheeling in quarter column is the only point that was found more attention was acquired for. Confidential review reports on Indian Army units for 1913-1914: IOR/L/MIL/7/17023. 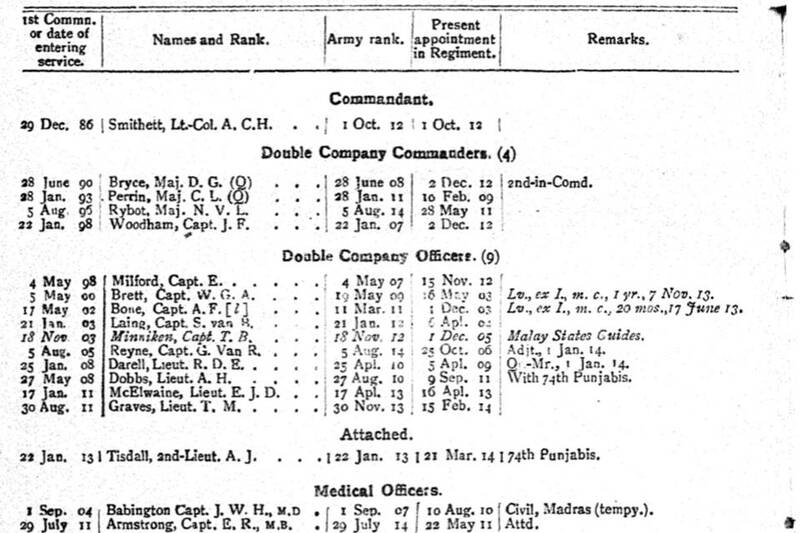 The extract below was taken from the October 1914 Indian Army List which is a great resource if you’re researching either officers or units of the Indian Army. The 76th Punjabis received orders to mobilize on 21 October 1914 and embarked at Karachi on 31 October as part of the 30th Indian Infantry Brigade. The Regiment initially served in Egypt between November 1914 and March 1915. During the time, the Regiment defended the Suez Canal but wasn’t involved in any fighting. The 76th Punjabis subsequently moved to Mesopotamia (Iraq) and landed at Basra on 7 April 1915. Between April and August 1915, the 76th Punjabis served as part of the 30th Indian Infantry Brigade in the 12th Indian Division. The Regiment fought in a large number of engagements, described in the war diary, including the capture of Nasariyeh in July 1915 while serving with the Division. In September 1915, the 30th Indian Infantry Brigade joined the 6th (Poona) Division which was advancing on Baghdad. Just before Baghdad, near the Arch of Ctesiphon, the Division was halted by Turkish forces. The Battle of Ctesiphon (22-25 November 1915) was a disaster for the 6th (Poona) Division which was forced to retreat to Kut-al-Amara. The 76th Punjabis was one of the Indian infantry regiments which was besieged at Kut-al-Amara and captured when the town fell on 29 April 1916. During the Siege of Kut, between December 1915 and the end of April 1916, the Regiment suffered 171 casualties. Approximately 250 officers and men were taken into captivity after the fall of Kut and many would perish from ill-treatment and disease. Many of the drafts sent from India for the Regiment while it was besieged were sent to the 82nd and 92nd Punjabis and fought in the failed relief attempts. On the 1 January 1917, the 76th Punjabis’ Depot received orders to reform the Regiment. Part of the newly formed 76th Punjabis was sent as a nucleus to the 2nd Battalion 76th Punjabis which was raised later that year. The 1st Battalion 76th Punjabis spent the rest of the war in India reforming and in 1922 became the 3rd Battalion 1st Punjab Regiment. There are three war diaries for the 76th Punjabis and the latter two have been digitized and are available to download from the National Archives’ website. 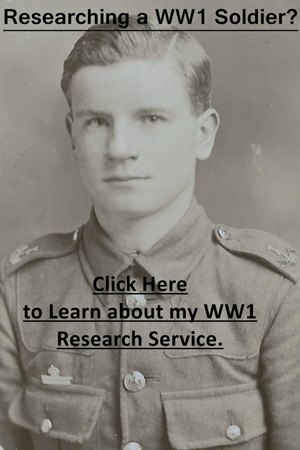 To download them for a small fee click on the blue links below which will take you to the National Archives’ website. As of January 2018, the war diary covering the period the Regiment was in Egypt has not been digitized. I have copies of all war diaries and have transcribed some entries below. Notes: A short war diary of only 5 pages which stops abruptly on 4 February 1915. Between 25 January and 4 February entries are long, taking up 50% of the war diary. Notes: A very detailed war diary. There is an excellent account of the attack on the village of Khafajieh on 14 and 15 May 1915. Including a list of casualties and the swimming party (the majority of whom were awarded the Indian Distinguished Service Medal). One of the most detailed and well-written accounts I have come across. Also, another detailed account of operations around Ati’s House on 5 July 1915, with an operation order and rough diagram of advance for 5 July 1915 and a complete casualty list. August consists of 3 short entries. Notes: A short war diary of 9 pages. There is good information concerning the activities of the 76th Punjabis prior, during and after the Battle of Ctesiphon. The daily entries for the battle have been transcribed below. If you are researching a British or Indian officer who served with the 76th Punjabis the Indian Army List can be consulted. An excellent source of information for the 76th Punjabis are its confidential reports held at the British Library: Confidential Reports on Regiments etc. These also contain annual confidential reports for the British officers who served with the Regiment. Though when the Regiment is abroad only the Depot and officers serving with it are reported on. There is a list of Indian officers and men who were prisoners of the Turks in 1917 which includes those captured at Kut-al-Amara at the British Library. I have a copy of the list but can’t find the India Office catalogue number to put here! There is also a regimental history: A Brief History of the 3rd Battalion 1st Punjab Regiment: formerly 76th Punjabis… which was produced on the 150th anniversary of the Regiment. This is a small book which chronicles the entire history of the Regiment though the majority of its 56 pages cover the First World War. There are appendices covering honours and awards and British officers killed and wounded while serving with the Regiment. The book contains interesting snippets of information but is not essential reading. If you’d like to know more about the Siege of Kut I recommend Kut 1916: Courage and Failure in Iraq by Patrick Crowley. 8th November 1915 – 7 am – Kut-al-Amara – 76th Punjabis, 1/2 48th Pioneers, 3 1/2 squadrons Cavalry marched from Kut to join 6th Division at Azizie (59 miles), owing to Supply and Transport Camels not being ready, did not leave starting point till 9 am so were only able to complete 15 miles by 4 pm. Bivouacked for the night, a good many men of the new drafts very footsore. 22nd November 1915 – 2 am – Column reached its destination and rested till 6.30 am when it stood to arms. 8.15 am – Regiment advanced on enemy’s position, 4 and 5 Double Companies leading supported by remainder, right flank covered by Machine Gun Battery, Cavalry and Machine Gun Motors, after advancing about 1200 yards, heavy fire opened from enemy’s position in front, first line reinforced and pushed on driving the enemy from his first position by rushing it. Regiment then pushed on towards 2nd position which proved to be too strong and at 10 am. The Regiment was held up and remained in this position till dusk, digging itself in. 4 pm – About 2000 enemy counterattacked our right advancing to withing 4-500 yards but retire on night falling. Major Perrin killed during the first half hour of the action and Lieutenant Colonel Smithett being severely wounded after the taking of the first position, the command devolved on Major Cotton about 10.30 am. 6 pm – No orders having been received it was decided to entrench the Regiment in a perimeter for the night. 7 pm – Orders received that Regiment to march at once to position V.P [?] about 3 miles South, wounded had to be carried slowly and with great difficulty, arrived camp on enemy’s captured position at 9.30 pm. No water available. Our casualties very heavy. 23rd November 1915 – Regiment employed collecting wounded, equipment, and keeping off Arab marauders until 3.15 pm and then marched off to occupy a captured redoubt and rest, after marching about three miles. The regiment was ordered back to V.P. position which was being heavily attacked by the enemy. Occupied a water channel in rear of fighting line as support at 5 pm and at 5.45 pm moved into fire-trench on left of 119th Infantry. Men suffered intense cold being without blankets, coats, food or water all night, enemy gathered in front at a distance of 600 yards but did not attack. 25th November 1915 – Evacuated trenches at 5.30 am. taking up a line of trenches to the rear to cover the retirement of the remaining troops on the position after evacuation of the wounded. 4 pm – Retirements commenced covered by 76th Battery Royal Field Artillery and 76th Punjabis, arrived camp without incident at 6.30 pm.